Over the past 60 years , the TRR Group has produced sugar products and supplied them to local consumers and industrial users . Its products are distributed via wholesalers and direct sales to industrial users .The Group's retail products under the local brand Lin are available for sale at leading modern-trade retail outlets throughout the country. 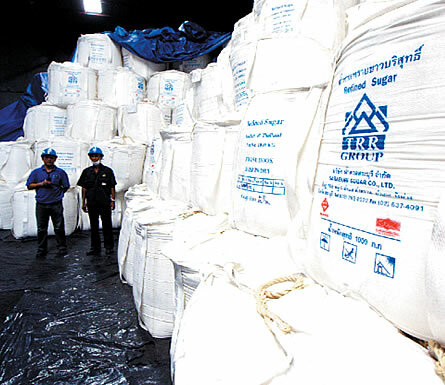 Thanks to its strict quality control and effective management system, the sugar products of the Group have gained the acceptance and confidence of its customers and are used for mixing in several leading-brand food products and beverages in Thailand and abroad . * No chemical bleach during production process. ** An ICUMSA rating is an international unit for expressing the purity of the sugar in solution,and is directly related to the color of the sugar. *** Polarization is an estimate of the sucrose content of sugar . Sugar of 98 degrees polarization would contain about 98 % sucrose. **** Polarization is an estimate of the sucrose content of sugar . Sugar of 98 degrees polarization would contain about 98 % sucrose.